I suppose it’s fitting that I was at my parent’s house getting ready to work during the Colts-Bengals game this past Sunday when I heard Stuart Scott had passed away. After all, that’s where I grew up watching and listening to him on SportsCenter. We didn’t get cable TV until I was around 10 years old and I actually remember the day the cable guy came to our house to install it. Suddenly having nearly 100 channels including Nickelodeon and Cartoon Network was nice, but the real reason I remember the day we got cable was because it meant we got ESPN. And of course, at that time ESPN’s main attraction was SportsCenter. This was before ESPN aired Monday Night Football or had a seemingly endless supply of sports talk shows airing all day long (for better or worse). This was before ESPN expanded to Los Angeles and started airing new episodes of SportsCenter into all hours of the night and morning. In the late 90’s, SportsCenter was recorded and the same hour-long episode played again and again until the next day. And Stuart Scott was there. I won’t even attempt to estimate how many hours I watched and listened to Scott on SportsCenter, but there’s little doubt that number borders on insanity as far as most people are concerned. In the days where a SportsCenter episode would air and re-air for 5–6 straight hours, I would routinely watch and re-watch the same episode because, well, what else was on TV in 1998 at 2:00am on a Saturday morning? The repetition of these highlights coupled with a personality like Scott was the perfect combination for anyone who was biding their time until the next live sporting event. Even the third time around, his “Boo-yah” still made your ears perk up and “you ain’t gotta go home but you gotta get the heck up outta here“ still brought a smile to my face. 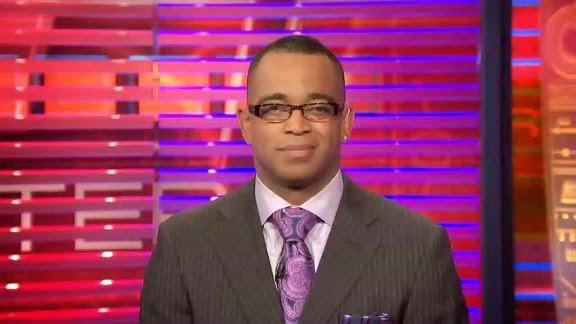 Some SportsCenter anchors had a tendency to fade into the background as a show progressed, but you always knew when Stuart Scott was behind that desk reading off the teleprompter. For those of us who love sports and watched Scott on SportsCenter for years, he was an indelible part of the way we consumed our passion. It might sound crazy, but Stuart Scott and all those old SportsCenter re-runs are engrained in my sports consciousness, even if it took his passing to remind me of the impact he had on me as a sports fan. But, as we all know, Stuart Scott’s passing is much bigger than sports and much bigger than SportsCenter. Whether you loved what Stuart Scott brought to ESPN or you weren’t his biggest fan, we can all appreciate the person he was and the way he lived his life. Scott said during his now famous ESPY’s speech that he isn’t special for the way he fought cancer. While we would all surely disagree, the way in which he interacted with people, the way in which he lived his life, and the way in which he persevered while fighting cancer are all things every single one of us is capable of doing. It’s probably not this easy, but I’d like to think that maybe we just need to flip our pillow’s over to the other side so we can tap into the way Stuart Scott lived his life. I never thought I’d say this, but I’d love to watch and re-watch Stuart Scott on SportsCenter once more. Just for old time’s sake.